Discussion in 'About This Site' started by Forest, Feb 22, 2013. Help, I'm new to TMS! What do I do? What rules should I follow when posting? What is the PPD/TMS Peer Network? How can I get my questions answered using the TMS search engine at search.tmswiki.org? What is a wiki? How is it different from a forum? New: What is the Ask a TMS Therapist program and how can I participate? New: How do I find new books and other resources? New: How do I find a TMS doctor, therapist or coach? The name of the nonprofit is the PPD/TMS Peer Network. So what is PPD? How can I find more free things to read? Is it okay to respond to old threads? How can I get faster feedback? How do I include a video in my post? How do I include images in my post? How do I quote posts? How do I add my story to my profile? How can I see all of the forums quickly? I love reading people's profile pages. Who has put some effort into their profile page? Which practitioners frequently post on this forum? Help, I'm new here! What do I do? At this point, you will want to keep things simple. Get a TMS book and read it and think about how what it describes applies to you. You may also want to try out the Structured Educational Program. It is very popular in our community and we have found that the feedback from the various posts is very helpful to people while they are recovering. You may be tempted to try to read every book and every post, doing every program as well. However, attempting this can wind you up when the main goal of TMS healing is to find a way to soothe yourself. Eventually, you may find that developing a mindful or meditative approach to how you are feeling helps, but for right now, you've got a lot on your plate. You might find it helpful to restrict your attention to the Support and Structured Educational Program subforums because that is where the conversation is most tuned to the needs of newcomers. Whatever you decide is best for you, the people here understand what it is like to live with severe pain or other symptoms, so you are very welcome here. Feel free to ask any questions you have in the Support Subforum. We try to keep things casual, supportive and friendly here, but there are a couple rules that you should follow. Most people find the rules to be common sense for public supportive discussion about personal and contentious topics. However, I have written them out in some detail here so that when conflicts come up (as they inevitably will), the moderators have guidelines to point back to. Please keep threads on topic. If you come up with a new topic in the middle of a thread, just create a new thread and link to it from the old thread. A moderator can help you move posts over to the new thread. Please be respectful of other people's opinions. When discussing topics that are contentious or when there is a disagreement in the thread, make a special effort to be polite and state your opinion as your opinion rather than fact. If someone is saying something in a thread that you think they shouldn't say and you've already exhausted the process of respectful dialogue, just read another thread. There is space here for everyone. Do not promote conflict. When conflicts arise within a thread, discuss ideas rather than criticizing people. If you have a problem with a forum member, feel free to link to these rules (see below for a short link to these rules) or to contact a moderator. Avoid repetitive or mean-spirited attacks of people in the mindbody community, including authors. 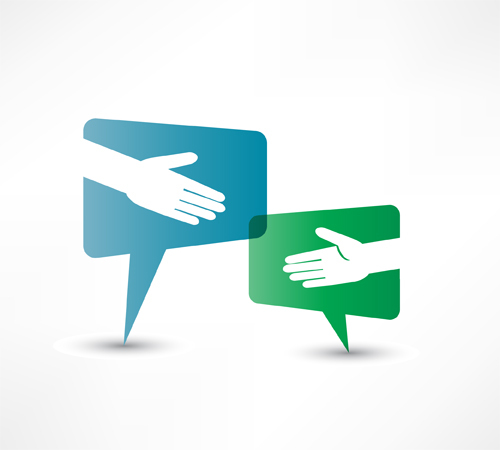 Avoid discussing topics, such as politics or religion, that are both contentious and off topic for the forum. Please keep things polite. Choose a respectful style rather than an inflammatory one. If you see someone making a personal attack or an inflammatory post, just ignore it, or, if it is egregious, click the "report" link. Work with the moderators. If a moderator gives you an instruction in a thread, follow it. Use common sense and follow the spirit and not just the letter of these rules. Posts that violate the letter or spirit of the rules here may be moved, locked, deleted or edited. Do not attempt to create public drama if you have a concern with how your posts have been moderated. Moderators generously volunteer their time for the benefit of the community, so contact the mods privately (i.e. not in public) with any concerns. Additional guidance can be found by clicking here. The PPD/TMS Peer Network (PTPN) is a 501(c)(3) tax-exempt nonprofit public charity that sponsors this forum. It also sponsors sponsors and operates the TMS Wiki and all of its sister programs including: the Weekly TMS Drop-in Chat, the Weekly Call-in Discussion Group, Bi-Monthly Teleconferences and a newsletter for TMS Practitioners, several mailing lists for both peers and practitioners, TMS Webinars, the Thank You, Dr. Sarno project, and many other programs and projects. Our mission is simple. We seek to provide free resources and support to help people overcome chronic pain and reclaim their lives. We hope to empower people to turn their negative experiences with TMS into positive ones by giving them a platform to share their stories and help other people recover. All members of both the Executive Council and the Board of Directors have had PPD/TMS at some point in their lives and make no money off of TMS. A majority of these members consider themselves to have recovered from chronic pain and experience little to no pain. Finding information about TMS is a major part of recovering. 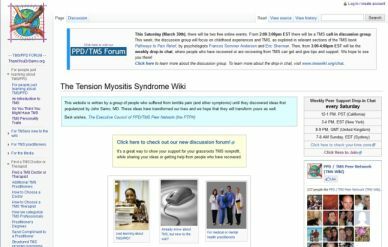 To find all of the information we have about a specific topic use our TMS Search Engine found at search.tmswiki.org. Our TMS Search Engine uses Google technology to search more than fifteen thousand pages of information about TMS. A wiki is a website that can be edited by anyone, whereas a forum is place to ask questions and discuss TMS-related topics. The TMS Wiki is an encyclopedia for all things TMS. It is written entirely by people who have or have had TMS. Like with Wikipedia, people collaborate to write encyclopedia articles about specific topics. It has a white and grey backdrop, as pictured below. The TMS forum is designed to give users a place to interact with each and to ask questions about TMS, and how to recover from chronic pain. It has a blue top, and is pictured below. This might seem a bit confusing because many people think of this entire site as "The TMS Wiki." However, technically speaking, only the pages with the grey background that look a little like Wikipedia are wiki pages. Right now, you are actually looking at the forum rather than the wiki. You are welcome to use and participate in both halves of the site. Eventually, we want to get more people editing the wiki half, but for now, most people just use the forum, so make an account and start posting! One caution is that you can log in to both halves of the site, so if you want the forum, make sure you are looking at the forum (with the blue top) when you log in or try to make an account. In terms of editing the wiki half, we use the same software that Wikipedia does, so if you can edit Wikipedia (and you can! ), you can edit the TMS Wiki. For an introduction on how to edit visit our Editing Tutorial. If you would like to create an account and get started, just contact Forest and he will guide you through the process. The Ask a TMS Therapist program is a free resource. Via the Ask a TMS Therapist program, you can submit a question pertaining to TMS healing to be answered by one of five licensed TMS therapists from the PPC. Their response, along with the original question, is then posted on the forum where others can read and discuss it. All Ask a TMS Therapist threads can be found in the Ask a TMS Therapist Subforum. To participate in the Ask a TMS Therapist program and submit a question of your own, simply use this form. You can choose to submit your question using your forum account, or completely anonymously through a guest account. There is no limit to how many questions you submit. How do I find new books and other resources? You don't have to read a million books about TMS in order to heal. Instead, you should trust your gut and start with just one book, making sure you really understand it. However, there are many books that our community has found interesting and helpful. If you are interested in learning about other books, we have several resources. On the wiki half of our site we have a list of most of the books that our community has found most helpful so far. Click here to visit it. Forest also maintains a list of the best selling MindBody books on Amazon. Click here to learn more about it. You can also use our search engine, search.tmswiki.org and type in something that you are interested in and the word "book." You never know what you may find! When you see that prefix, you can just click on it to find all of the official threads about books. (Try it!) Similarly, we also have special prefixes for DVDs, multicomponent programs, and audio. How do I find a TMS doctor, therapist or coach? Check out our Find a TMS Dr. or Therapist or Additional Practitioners lists. PPD is just another word for TMS. It stands for Psychophysiologic Disorders and is a term developed by the Psychophysiologic Disorders Association, whose board of directors consist of many prominent TMS practitioners including: Frances Sommer Anderson, PhD, SEP; Dave Clarke, MD, Alan Gordon, LCSW; Ira Rashbaum, MD; Derek Sapico, MFT; Howard Schubiner, MD; Eric Sherman, PsyD; Jeff Wentzel, PhD., and Peter Zafirides, MD. The term itself was developed with the hopes that it would be more acceptable to non-TMS physicians, as it more accurately addresses the development of symptoms that go beyond muscle and nerve related pain, such as dry eyes, gastrointestinal disorders, anxiety, tendinitis, and dermatological conditions. The idea behind the term is that if it describes the mindbody process more accurately it will be more likely to overcome opposition from the medical community. This story explains why some people choose to use the term PPD and why the acronym is incorporated into the name of the PPD/TMS Peer Network, the nonprofit that sponsors this site. You are welcome to use whatever term you like for TMS. Most people simply use the term TMS because that is what everyone else uses. There is a tutorial on how to add images to your post in this thread. Go to search.tmswiki.org. The wiki is HUGE. Use the TMS search engine to find new articles, blog posts, and forum posts about topics you are interested in. You can also check out other TMS websites, such as the Dr. Sarno tribute website, www.thankyoudrsarno.org. It contains a whole bunch of moving and inspiring success stories. You can also get a different perspective by reading through, rsi-backpain.co.uk or conquerrsi.com. Both of these sites are filled with TMS-related info. Yes! Old threads are filled with wonderful tidbits of information about TMS and how to recover. If you want to respond to one go ahead, and share your thoughts. It is great to have a fresh take on posts from the past. Using quotes is a great way to discuss specific ideas from another post. There is a tutorial on how to use quotes in the How to quote posts thread. All logged in users have the capability to send private messages to other members. To do this simply click on the the "Inbox" tab located in the top right of the screen. Once you are in your inbox click on the "Start a Conversation" tab, which is also located on the top right of the screen. Add the participants you wish to message in the "Participants" field, and type your message in the message box. To send click on the "Start Private Conversation" button. For more, please watch the following video tutorial. There is a tutorial on how to add your story to your profile in this thread. Can I rename my account to preserve my privacy? A. Yes, it is possible for users with privacy concerns to request to have their username changed. Our organization values our member's privacy, and we encourage any one to use a pseudonym if they would prefer. If you want to change your username for privacy reasons simply send a message to Forest, and he will accommodate your wishes. For more information, see this thread. This entire website is run and paid for by volunteers who have recovered from TMS with the help of the online community. The most important thing that you can do is by providing support for your peers in our forums and chat room. For more information check out the page: How You Can Help. The best way to get feedback is to provide details. It can be challenging to answer a question with a limited amount of information. When you post mention some of the things you have tried before and, more importantly, what some of the emotions you are dealing with. Also, see if the topic you want to discuss has been brought up recently. If another thread discusses the same topic, post your question in that thread. In short, the more you open up, the more other people will share in their responses. You can quickly see all of our forums by using the Quick Navigation Menu, found in the far right portion of the light blue location menu. Simply click on the blue arrow and a screen will pop up with links to all of our forums, and your profile page. There is terrific information found on people's profile pages. Some users even write their success stories on these pages. They can be a great resource for anyone interested in learning more about TMS. The following are some people who have their stories and other information on their profile pages: BruceMC, Enrique, Explorer, HilaryN, Igloo, Jakedrum, JanAtheCPA, Josina, JoyceVT, Lala, Layne, Linnea, Livvygurl, Lori, Matthew, Pandamonium, Quasar731, Rinkey, Shabda-girl, Steve, and tarala. We hope that you've found this thread helpful. As our nonprofit grows, additional posts containing more Forum FAQs will be added to this thread. To keep room available for these new posts, the thread has been locked, and you can't reply to it. If you have an additional question that isn't in this thread and that you would like an answer to, please start a new thread in our How to use our programs subforum. Experienced members of our community periodically visit that subforum and will make sure that your question is answered. Alternatively, if you have a suggestion for improving this Forum FAQ thread, please post it in the corresponding feedback thread. We wish you the best in your recovery! Additional guidance on forum rules. 99.9% of forum members follow the forum rules automatically, without even needing to be asked. Some, however, play by different rules. There is nothing necessarily wrong with that, but this additional guidance is here to let them know what their responsibilities are if they want to participate in this community. On the flip side, this same post provides guidance for our volunteer mods to help them better know how to enforce the forum rules. By providing a public resource for both "the .1%" and the volunteer mods, my hope is to get everyone on the same page. That way we can focus on discussing mindbody medicine and providing peer support, which is the real goal here. First, some commentary on the forum rules found above. No trolling. Do not disrupt threads or sow discord. If you have had drama with another member, avoid making posts in the same threads as they do. Respect other members' feelings. When people are discussing topics that for them are traumatic, if you can't participate in the thread in a manner that is both respectful and caring, then refrain from participating at all. Don't make repetitive posts to attempt to control opinion on the forum. Everyone has the right to have their own opinion, so just let it drop. Do not attempt to make people feel unwelcome based on the opinions they express. This post came about because of an incident about a month ago when one member disrupted a thread where other members were providing each other support. A woman honestly and vulnerably described being raped and also being sexually assaulted and later in the same thread, another member was still making jokes and trolling. Of course, havoc broke out. One member wrote, in anguished tones, "GUYS, WHAT IS HAPPENING HERE????" Reading it afterward, I felt exactly the same way. This post is to prevent that type of thing from happening ever again on this forum. It is your responsibility to know and follow the rules here. As mentioned above, 99.9% do this without needing to be asked, but I'm trying to spell it out because I don't want to lose the remaining .1% if I don't have to. Breaking the rules above is pretty easy and may even be fun for the person doing it. Enforcing the rules is very time consuming and not at all fun. We won't always come after you for every infringement, but don't burn your bridges by thinking "you are getting away with it." Even if you don't hear from us, I probably personally spent 4 hours on it. At a certain point, we lose interest in protecting you. Allowing people to respectfully present their opinions regarding mind body medicine in an appropriate manner and place is a core value of this forum. These rules don't change that. JanAtheCPA, Eric "Herbie" Watson, plum and 1 other person like this.